Three neighbours set out for a wintery morning walk. By the corner of Harbord and Grace, the topic was food. Sue: I saw your husband having Chinese delivered last night. Nicky: Our Florida Airbnb host didn’t list a local grocery store in the guide binder. Barb: I noticed in Bangkok that a lot of people eat on the street. Given that comment one was not surprising, and number two was a small complaint lessened even further by the Florida tan of the commentator, Bangkok occupied the next several minutes of chat. Barb speculated that Thai citizens and tourists alike were eating street food because tiny downtown living conditions did not support meal preparation. If true, would this be a driving force in large Canadian cities where housing costs for small spaces are prohibitive? A Vancouver one bedroom 513 sf condo on Seymour Street lists for $599,000. A basement studio in Little Italy, Toronto rents for $1,400/month plus utilities. On the other hand, a 2 bedroom, 1 bath house can be found in North Sydney for $150,000. Prices aside, though, Canadian climate doesn’t support extensive, continual street eateries. Back to Bangkok … research suggests that commercial indoor rent rates rather than limited kitchen space may be the more predominant reason for sidewalk food stalls. Studies over the last twenty years also suggest that three-quarters of these vendors are women of which 2/3 are over 40 years with little education. One of the more famous open air cooks is “Auntie Fai” (Supinya Junsuuta). In 2018, she won a Michelin star in Bangkok’s first restaurant guide. You’d recognize her. She’s the one wearing ski goggles to protect her eyes from the splashing hot wok oil cradling those delicious crab-meat omelettes. 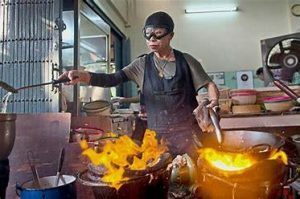 Auntie Fai is a member of the specialized street vending culture that contributes to food being cited as the #1 tourism attraction for Thailand. For over twenty years, it seemed to be a safe economical income choice for a specific demographic of females. The 2014 military takeover brought a move to regulate Thai sidewalks. Citing issue with food handling hygiene and pedestrian traffic, the Bangkok Metropolitan Administration stepped up reinforcement. Near city wide bans for April 2017 were announced to remove/relocate sidewalk stalls. These started in high-income commercial and residential neighbourhoods. There is citizen pushback. Vendors are protesting and organizing collective strategies. It’s a reaction against “…the war being waged against the city’s own people, the poor and vulnerable.” said Poonsap Tulaphan, director of Home Net Thailand, which support informal workers. Kan Yuenyong, executive director of NFO Sian Intelligence Unit thinks the street food ban might be temporary. A similar reaction happened in 1972 but outcries from tourism forces tempered the street gentrification push. Narumal Nirathron, a professor at Bangkok’s Thammusal University offered that hawkers can make localities more dynamic, and keep an eye on street level security issues. The Bangkok food scape is yet another example of a gender driven industry that is subject to flip-flop politics. Let’s be aware of the struggles that these women are enduring to stabilize income. “Food is the #1 reason for coming to Thailand.”; The Nation/Asia News Network; September 17, 2017. Note: The Thomson Reuters Foundation is the charitable arm of Thomson Reuters that covers humanitarian news, women’s rights, trafficking, property rights, climate change and resiliency.